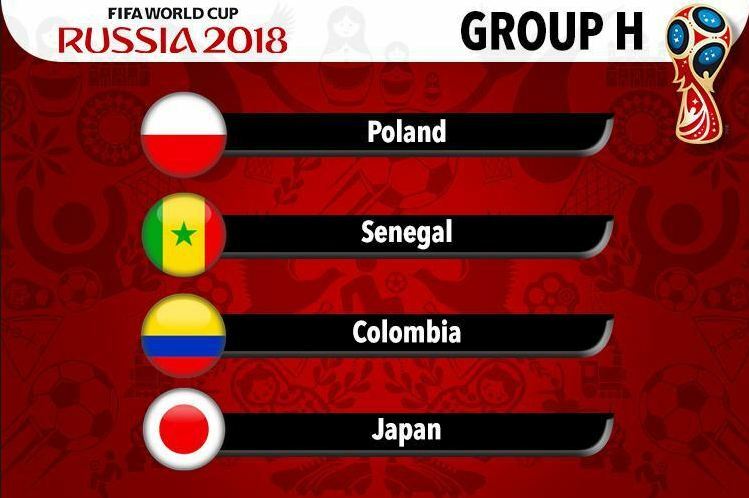 The very last group in this years World Cup contains Colombia, Japan, Poland and Senegal. This is probably a group were anyone can qualify out of and there is no real favourite just waiting to go through. It will make the games very interesting and also very open. The managers and players will be well aware that maybe a win and a draw would put them through to the knockout stage so they will definitely be going for it. Poland are back in the World Cup for the first time in twelve years and they have previously reached the semi finals on two separate occasions. They qualified for Russia from a group that included Denmark, Montenegro, Romania, Armenia and Kazakstan. The coach of the Polish side is Adam Nawalka who has played 34 times for his country including the 1978 World Cup. Since taking over in 2013 he has really made a big difference to the Poles and he also got his team to the 2016 European Championships in France. On their road to the finals they only had one setback by losing four nil to Denmark and they won the group by a clear five points. Two players to keep an eye out for for during the tournament are Bayern Munich,s Robert Lewandowski and Napoli,s Arkadiusz Milik. Lewandowski is a super striker who always seems to to be in the right place at the right time to grab you a goal. During qualification he managed to grab 16 goals and that was the platform for Poland,s qualification. As we go into the tournament his future at Bayern Munich is uncertain and if he manages to have a good tournament who knows where his future may be. Milik became one of Poland,s most expensive players when he signed for Napoli in 2016 for €35 million. He can also get his fair share of goals as well and this is a major plus for this Polish side, because when you have more than one goal scorer in the team it can only be good news as they head into the tournament. Although there is no outstanding candidate for qualification out of this group Poland will be fancied and if Lewandowski hits the net the knockout stage could be very interesting indeed for them. Senegal reached the quarter finals in 2002 and it was a team that played with passion and flair. Their captain back then was Aliou Cisse a defensive midfielder who nowadays is coaching the team who have reached the 2018 Finals. They got to Russia by qualifying from a group that contained Burkino Faso, Cape Verde and South Africa. They won the group by five points and pretty much had it all their own way in the campaign. The players like most of the stars from Africa play their football all around Europe and the knowledge they have picked up from that will only stand to them as we enter the opening phase of this tournament. Two players to look out for when the competition starts are Liverpool,s Sadio Mane and West Ham United,s Cheikhou Kouyate two stars of the modern game. Mane is one of the most dangerous attackers in the Premier League and he cost Liverpool €34 million when he moved from Southampton two years ago, he has won over fifty caps for his nation since making his debut in 2012. His speed and agility on the ball is something that has not been seen in the Premier League for a very long time and if he is given the supply of ball during the competition by his colleagues he could be one to watch for top scorer. Kouyate is a midfield enforcer and also captain,s the squad. His first senior appearance was in 2012 for his country and ever since he has been doing a job for his nation as a real leader. How Senegal will do in this tournament is anybody,s guess but they will be a team to keep an eye on as the days progress. Colombia qualified for Russia by the skin of their teeth when they finally secured a spot with a 1-1 draw in Peru. Under the guidance of manager Jose Peckerman one of Argentina,s greatest coaches, they got fourth place in a South American mini group which also included the likes of Brazil, Argentina and Uruguay but they just scraped home in the end. The Colombians have a great history in the competition and in 2014 they got to the quarter finals losing 2-1 to Brazil in the hosts back garden. This will be Colombia,s sixth appearance in the finals and they have a very experienced squad going into the finals. Two players to look out for when the tournament starts are striker Radamel Falcao of AS Monaco and attacking midfielder James Rodriguez who is on loan from Real Madrid at Bayern Munich, James had a magnificent World Cup in 2014 and in my opinion was the player of the tournament. Falcao is Colombia,s all time top scorer and has over 70 appearances for his country. He made his name in Argentina with River Plate before moving to Europe and was unfortunate to miss the 2014 finals with a knee injury. The squad that has been assembled for this tournament by manager Peckerman is full of experienced players and in a World Cup were a suprise may jump out and catch us all unawares do not overlook this Colombian team. Japan have qualified for the past five World Cup Final,s but have yet to get beyond the round of 16. That statistic is quite outstanding when you take into account the quality of the players they can call on. They qualified for this years tournament by winning Group B in the Asian Round 3, the group also included Saudi Arabia, Australia, United Arab Emirates, Iraq and Thailand. During their campaign they won seven and drew one of their matches scoring 27 goals and conceding none, now that is some qualifying campaign. Two players to look out for during the competition are Borussia Dortmund,s Shinji Kagawa and Keisuke Honda who plays his football in Mexico. Kawaga has played both in Germany and for Manchester United in England. He is a hard working midfielder and has over 90 appearances for the Japanese, he was also voted Asian Footballer of the Year in 2012. Honda is a brilliant play maker in midfield and has won over 90 caps for his nation since making his debut in 2008. He has appeared at the last two World Cup Finals and was voted player of the tournament when Japan beat Australia in the Asia Cup in 2011. This group is wide open and there are definitely possibilities that the Japanese could get through to the knockout stages. This will only be a success for Japan if they can get through the round of 16.